My card today is super easy. I started with a 4″ x 11″ piece of Neenah Solar White cardstock. It was folded in half and the bottom left corner was rounded. One corner of a 2 1/2″ x 5 1/4″ piece of Echo Park’s Holly Jolly Christmas paper was rounded before the edges were sanded. The layer was adhered to the left hand side of the card front. I have had the Taylored die Merry for a while and had to use it before Christmas is over. I like it a lot. I cut two Merry’s out of Red Devil Fourz Bazzill cardstock and one of silver glimmer paper. They were adhered to the lower part of the card base. Three tiny rhinestones were added on the Y of the bottom Merry. Next I cut and embossed silver glimmer paper and Red Devil cardstock with the two small dies from the 2012 Snowflake Pendant Shapeabilities® die set. 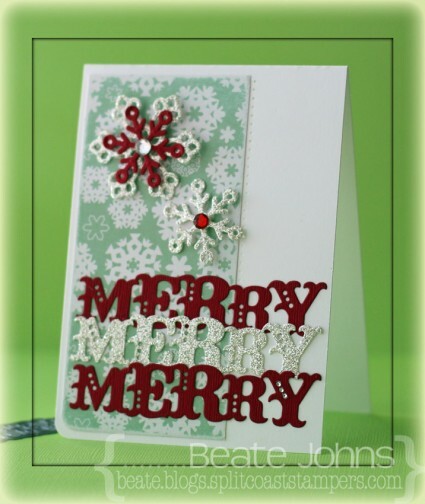 The snowflakes were adhered to the upper right hand side of the card front and topped with rhinestones. A paper piercing edge along the paper strip above the sentiments finish off the card. I want to wish you a Merry Christmas. I hope you have a wonderful time with friends and family! Have a wonderful day! Merry Xmas to u & your family Beate! Super cute card! Merry Christmas to you and your family Beate! Froehliche Weihnachten! What a beate-iful card!! I just wanted to say thank you – I don’t comment often, but I have you enjoyed your art and tutorials all year long and appreciate it! May you have a wonderful New Year. Beautiful, elegant simplicity. Have a very merry day and best wishes for a wonderful New Year! May you and your family have the best Christmas of all. Thank you for all you do for the crafting community. I am so thankful for all the God has done, especially sending His Son, Jesus Christ. Merry Christmas to you too, Beate. Look forward to your wonderful blog every day. May the new year bring you everything you desire. Wonderful card, Beate! Love the colors and the bling. Hope your Christmas was the best yet! Beate, this is wonderful! Love red and blue together and that pop of silver glimmer paper is gorgeous!!! Hope you and your family had a wonderful Christmas!! I love the color combo you selected….the red just pops. This is just lovely. I really like the single rounded corner…it’s a very fresh look. Your color combo is grand…and the die cut words and snowflakes are so festive. You have seemingly endless talent, Beate! So pretty, like the 3 merry’s and that glimmer paper is just so cool!! Cute card. I hope you and yours had a very Merry Christmas. Great card. I may have to get that die.